Recognizing the unique needs of the technology startup, Duening focuses on intellectual property development, funding, and marketing/selling more than other texts in this market. Extensive use of technology examples, case studies, and assignments keeps the book relevant and motivating for engineering students. 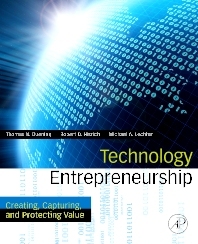 Undergraduate or graduate students taking technology-focused entrepreneurship courses in engineering or business schools. Thomas Duening previously was the director of entrepreneurial programs for the Ira A. Fulton Schools of Engineering at Arizona State University. He obtained his undergraduate degree from the University of Wisconsin-Stevens Point and then attended the University of Minnesota, where he received his master’s degree in philosophy of science and his doctorate in higher education administration. While completing his Ph.D., Duening was a consultant at Robert S. Banks, Associates, Inc., an international consulting firm serving the electric utility industry. He also has served in many executive positions, including president of U.S. Learning Systems, LLC, vice president for Content Development at Edgia, Inc., and still remains owner and CEO of the consulting firm INSYTE Business Research Group. Before joining ASU in September 2004, Duening successfully launched the Entrepreneurial and Venture Development Center at the University of Houston-Downtown. For nine years, he was the assistant dean for administration, and international and executive programs at the C.T. Bauer College of Business at the University of Houston main campus. Duening is the author of numerous journal articles, and he is the author of 12 books on investing in entrepreneurship, including Technology Entrepreneurship released Aug. 19, 2009. Dr. Robert H. Hisrich is the Garvin Professor of Global Entrepreneurship and Director of the Global Entrepreneurship Center at Thunderbird. He is also president of H&B Associates, a marketing and management consulting firm he founded. He has authored or co-authored fourteen books, including Entrepreneuship: Starting, Developing, and Managing a New Enterprise (translated into nine languages and now in its sixth edition), The 13 Biggest Mistakes that Derail Small Businesses and How to Avoid Them. Dr. Hisrich has served on the editorial boards of The Journal of Business Venturing, Entrepreneurship Theory and Practice, Journal of Small Business Management, and Journal of International Business and Entrepreneurship. He has instituted academic and training programs such as the university/industry training program in Hungary, a high school teachers entrepreneurship training program in Russia, an Institute of International Entrepreneurship and Management in Russia, and an Entrepreneurship Center in Ukraine. Michael A. Lechter, Esq., is Counsel to the international law firm of Squire, Sanders & Dempsey L.L.P., and Adjunct Professor in the Entrepreneurship Program in the Ira A. Fulton School of Engineering at Arizona State University. He is the bestselling author of OPM, Other People’s Money, How to Attract Other People’s Money For Your Investments – The Ultimate Leverage, Warner Books, 2005. An internationally known expert in the field of intellectual property, his clients have included everything from authors, breweries and professional sports teams to venture capitalists and medical manufacturers. Michael writes a monthly column for INC.com on Start-Up Businesses & Entrepreneurship. He is also contributing author to Licensing Best Practices: The LESI Guide to Strategic Issues and Contemporary Realities. He has lectured extensively throughout the world on intellectual property law and entrepreneurship. Upon request of the House Judiciary Committee he has submitted testimony to the Congress of the United States, and has participated in various United Nations and foreign government proceedings on intellectual property law and technology transfer.